Outsource Data Processing provides personalized mailing services through offshore facilities in India. We provide a vehicle for those who want to communicate a highly personalized message through the use of real handwritten correspondence. This can help in generating attention of the addressee. Getting stationary from India which can save shipping costs too! 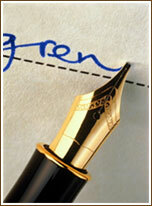 After handwriting stuff, we will send it to you via overnight services. All you need to do is get it stamped !